The Redskins will re-sign running back Adrian Peterson to a two-year deal worth $8MM, according to Ian Rapoport and Mike Garafolo of NFL.com (Twitter link). Peterson had indicated he’d like to stay in Washington, while the Redskins also expressed interest in retaining the veteran back. Despite some chatter that other clubs could target Peterson, he’ll return to the nation’s capital following a successful 2018 campaign. After collecting only a minimum salary deal last year, Peterson will now see a nice pay increase. He joined the Redskins after the club lost rookie second-round pick Derrius Guice to a torn ACL, and went on to rush 251 times for 1,042 yards and seven touchdowns. Advanced metrics weren’t nearly as bullish on Peterson, as he finished just 28th in success rate, but he was running behind a Washington offensive line that ranked just 24th in adjusted line yards. Guice will be back in 2019, as will pass-catching back Chris Thompson, so it shouldn’t be a surprise if Peterson’s attempt see a drastic decrease next year. However, with Case Keenum under center, the Redskins may need to utilize a run-heavy offense, meaning Peterson will still be involved in the offense. Peterson will 34 years old when next season gets underway, and only one running back age-34 or older has ever topped 1,000 rushing yards: John Riggins, who did it twice for the Redskins (1983 and 1984). Two key Redskins players, at different points in their respective careers, have engaged in discussions with the team about new deals. 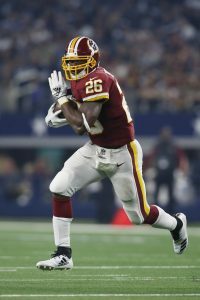 Adrian Peterson has participated in preliminary talks with the Redskins, John Keim of ESPN.com notes, adding Brandon Scherff — under contract via fifth-year option in 2019 — has been in discussions with Washington about his next contract. Peterson has said on multiple occasions he would like to return to the Redskins. The future Hall of Famer was a free agent throughout the 2018 offseason. Derrius Guice‘s injury led Peterson to Washington, and he responded with his eighth 1,000-yard rushing season. He also played all 16 games for just the second time in the past six seasons, the other being when he won the 2015 rushing title. Guice, though, is expected to be healthy for the 2019 season. The Redskins also have passing-down back Chris Thompson under contract. Peterson’s skill set would seemingly overlap with Guice’s, but the soon-to-be 34-year-old back is obviously the more proven NFL runner and could be used in a timeshare with the LSU alum. Scherff’s salary will spike from $6.8MM to $12.5MM this season. An extension would help the Redskins lower that cap number by a bit and help a team that will carry Alex Smith‘s contract in addition to a potential extra veteran starter-level salary, perhaps similar to the Dolphins’ 2017 Ryan Tannehill–Jay Cutler setup. It’s also possible the Redskins do not look to the veteran market to fill in for Smith. Washington is “looking hard” at quarterback prospects and continues to believe in Colt McCoy, Keim adds, pointing out a cheaper bridge-type option may be the better bet for Washington than a veteran starter. An upper-echelon guard since coming into the league, Scherff can be expected to command a deal in the neighborhood of the highest-paid guards in the NFL. Zack Martin and Andrew Norwell became the NFL’s first guards to sign for $13MM-plus per year. Washington, though, already has Trent Williams and Morgan Moses signed to high-end deals and holds barely $20MM in cap space. 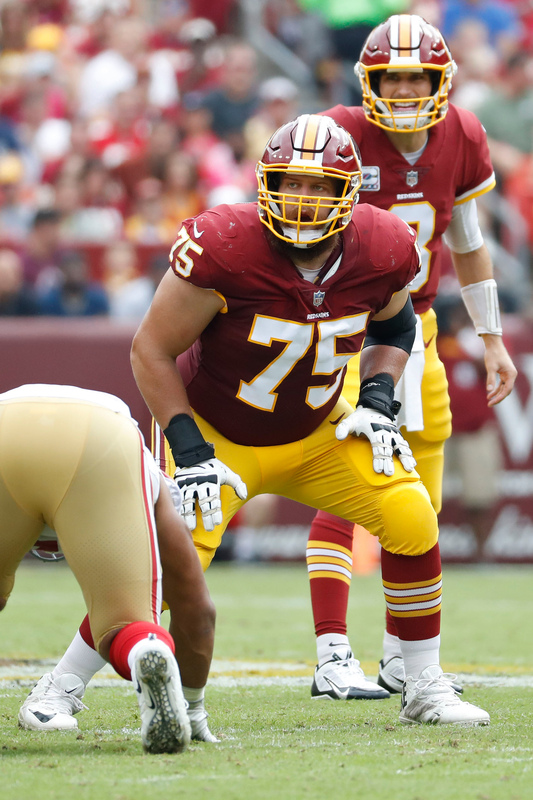 Navigating toward a Scherff extension won’t be easy. This is the time of year when NFL veterans tend to ponder retirement. That’s not the case for running back Adrian Peterson, however, who turns 34 in March. Of course, it takes two to tango and there’s no guarantee that the free-agent-to-be will find a home for 2019. Even if he does, few running backs outside Frank Gore have been able to keep it going in the mid-30s. The Redskins signed Peterson last season after losing rookie Derrius Guice to injury. Peterson silenced the doubters by running for 1,042 yards off of 251 carries, good for a 4.2 yards per carry average. The YPC was his best posting since 2015. He also added seven touchdowns on the ground and 20 catches for 208 yards and one TD over the air. With nearly 3,000 carries under his belt, and a clear desire for significant playing time, it remains to be seen whether Peterson will find a good fit this offseason. For what it’s worth, there appears to be mutual interest in a new deal in D.C. In August, the Redskins signed Adrian Peterson to a one-year deal after a rash of injuries to their backfield. Now, Peterson is hoping to continue that arrangement into 2019 and the Redskins also have some interest in a new deal, ESPN.com’s John Keim writes. After Week 13, Peterson ranks eighth in the NFL with 856 rushing yards, which isn’t too shabby for a 33-year-old running back. He was actually fifth in the NFL after eight weeks, but his yards per carry average has dipped in recent weeks thanks to a banged up Redskins’ offensive line and a shoulder injury of his own. All of these factors make it difficult to accurately assess Peterson’s performance. Last night, the Redskins got a glimpse of prime Peterson when he rattled off a 90-yard touchdown run in the second quarter against the Eagles. But, at the same time, he averaged just one yard on his other eight carries. You read that right – on a night where Peterson became the oldest player to rattle off a 90-yard touchdown run, he also failed to reach 100 yards overall. The Redskins are also expecting Derrius Guice to return healthy in 2019 and still have pass-catching specialist Chris Thompson under contract, so there’s not a real clear need for Peterson. Peterson, in theory, could split time with Guice, but he didn’t take kindly to his limited role in New Orleans and it’s not clear if he’ll be willing to average single-digit carries in 2019. For what it’s worth, he has the support of at least one teammate. Lions offensive guard T.J. Lang is still in the concussion protocol after having suffered his sixth career brain injury, but the team is still expecting the veteran to be back at some point this season. The 31-year-old was even in the building last week helping the team prepare for their matchup against his former team, the Packers. The offensive lineman previously said that he’ll continue to play football as long as his body holds up. Lang has also dealt with back, ankle and shoulder injuries during his tenure in Detroit. Su’a Cravens is currently sitting on the injured reserve with a knee injury, but Nicki Jhabvala of The Athletic tweets that the Broncos safety is expected to return to practice next week. The 23-year-old is eligible to return following his team’s game against the Rams this weekend, and the organization will have three weeks to activate him. The 2016 second-round pick was acquired from the Redskins back in March, and he’ll be looking to crack a depth chart that already includes Darian Stewart, Justin Simmons, and Will Parks. There seemed to be a difference in opinions when it came to Adrian Peterson‘s injury. ESPN’s John Keim tweets that the Redskins running back described the injury as a dislocation, while head coach Jay Gruden simply referred to it as a strain. Peterson underwent an MRI earlier today, and the tests ultimately revealed a strain (via USA Today’s Mike Jones on Twitter). The 33-year-old has compiled 242 rushing yards and three touchdowns on 60 carries this season. Adrian Peterson spent several months in free agency before landing with Washington recently. Although the Redskins did not fare especially well in a loss to the Broncos on Friday night, their 33-year-old running back showed he still has something left. Peterson is now a “stone-cold lock” to make the Redskins’ roster, Rich Tandler of NBC Sports Washington writes. While the future Hall of Fame back was brought in because of injuries to Derrius Guice, Samaje Perine and Byron Marshall, Tandler views Peterson as having usurped Marshall for a spot on Washington’s 53-man roster. Peterson amassed 56 yards on 11 carries in his Redskins debut. Tandler expects Washington to retain four running backs but doesn’t rule out the prospect of five surviving the post-preseason cuts. Here’s more out of the nation’s capital and the latest from some of the Redskins’ rivals. Thanks to Jonathan Allen‘s return and the arrival of his former Alabama teammate, Da’Ron Payne, Washington is deeper on the defensive line than it was last season. But Tandler expects one of the Redskins’ cogs up front to begin the season on the PUP list. Stacy McGee underwent groin surgery earlier this summer and was not expected to be ready for Week 1. A spot on the Reserve/PUP list will shelve McGee for six regular-season weeks. Former Redskins starter Matt Jones looks to have played himself out of consideration for an Eagles backup job, with Eliot Shorr-Parks of NJ.com handicapping the race for Philadelphia’s No. 4 running back job as a head-to-head battle between third-year player Wendell Smallwood and rookie UDFA Josh Adams. Shorr-Parks views Donnel Pumphrey, a 2017 fourth-rounder who missed all of last season, as third behind Smallwood — whom the Eagles are still intrigued by — and Adams in this race for work behind Jay Ajayi, Darren Sproles and Corey Clement. An Adams cut will likely result in another team claiming him, since the Eagles had to give him one of the largest UDFA guarantees any team authorized in this year’s post-draft signing period. The Cowboys‘ move of Kony Ealy to defensive tackle may not be enough to save his roster spot. Dallas is deeper up front this year, and although Ealy was a 2018 UFA signing, Clarence Hill of the Fort Worth Star-Telegram has the former Panthers second-round pick off the 53-man roster. Former Dallas waiver claim Brian Price resides in front of Ealy, in Hill’s view, for a roster spot. Ealy signed a one-year, $1.25MM contract, with a $200K signing bonus, in April. Also lost in the shuffle here is recent Cowboys trade acquisition Jihad Ward, who Hill doesn’t see making the roster. Both of these former second-round picks will at least need to show well in Dallas’ final two preseason games to have a shot. One of the Eagles‘ 2018 UDFAs, safety Stephen Roberts, did not last until the final cut. Philly waived the Auburn product earlier Saturday, and this came after the defending Super Bowl champions guaranteed $52K of his base salary, per ESPN.com’s Field Yates (Twitter link). That amount was one of the highest guarantees allotted to any UDFA this year, so it’s possible Roberts will generate some waiver-wire attention.